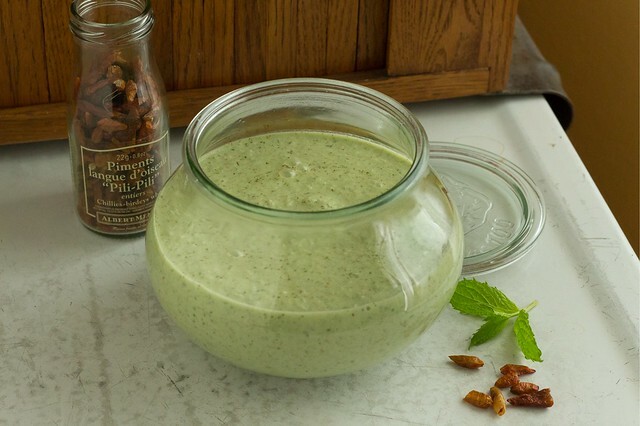 Diana Henry's Cucumber Yogurt Soup. You might not believe that I've been meaning to write about this cold soup for more than a year. It's been about that long since I first read about it in Diana Henry's book A Change of Appetite. Last spring and summer I made it at least a dozen times, each time making it different and using the ingredients list as more of a suggestion. As written, it is fantastic. But it also is good using just about anything you have growing. This soup is cold, and for someone who just can't quite warm up to chilled tomato based soups (I want to love them, I swear), this cucumber version I can't get enough of. It's better if you can make it at least several hours before eating, and it improves with a day or two of refrigeration, and no one will judge you if you pour it into a pint glass and just drink it with a straw. It makes good use of gracefully staling sourdough bread and nuts: Henry's original version uses walnuts, but pecans and almonds are both useful substitutes. And someone out of yogurt could well use milk kefir, buttermilk, or sour cream as I have, all to good effect. I've never actually made it with the rose petals, chicken stock, tarragon, or white balsamic - instead a splash of floral rose flower water, dark balsamic or cider vinegar for a nuance of tang, and enough water to make it soup consistency. Click above to see the original recipe, since I will list the way I make this cold cucumber yogurt soup, with some of the things I've substituted. 1 or 2 cucumbers, unpeeled if English but peeled and seeded if a garden variety. 1/2 - 1 cup walnuts, pecans, or almonds, toasting optional. I also like adding chia seed on occasion. 1 garlic clove. Henry calls for 4, but I don't care for that much raw garlic. scallions, walking onion, or any onion you enjoy raw, about 1/2 - 3/4 cup. fresh dill if you're lucky, dried dill if you're me. about 10-20 fresh mint leaves. 4-8 driedpili-pili chiles. A friend gave me these chiles that are surprisingly hot. Use any dried chile or chile flake you like. a 2 inch slice (or larger) gracefully staling sourdough bread, most of the crust cut off, and torn into big pieces. 1/2 - 1 cup yogurt, Greek or runny yogurt, buttermilk, kefir, sour cream all work well. at least 1/3 cup olive oil, more for a larger portion. 1-2 T. vinegar of choice, balsamic, white wine, rice wine, apple cider - use something you like. The beauty of this soup is that it is all but made by tossing everything into the blender with very little prep work. 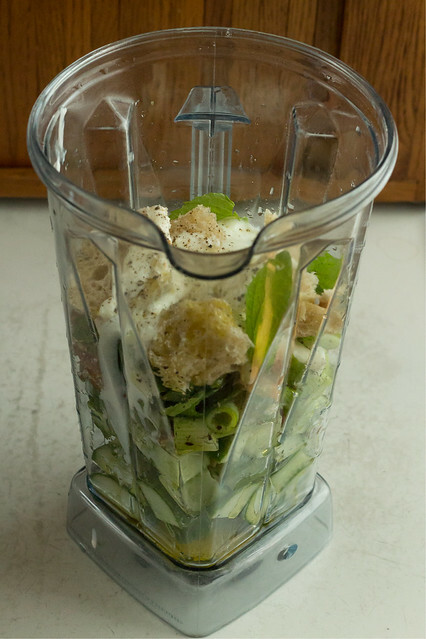 If you have a high-speed blender, this is especially fast; a conventional blender might take a little more coercion to reach the right consistency. This soup is one that is best tasted several times while making and adding to your taste. I also like to stir in any number of garnishes before serving, including any of the above ingredients that you might save aside to include on top. I also like hardboiled egg, baby garden greens, cherry tomatoes, thinly sliced radishes, or other things lurking in the fridge that might need using up. This is the prettiest soup in person, with little flecks of bright green herb suspended in the mixture. I try not to puree it silky smooth (which I could do in my Vitamix), but leave it with some texture that lets you know that there are both bread and nuts in it. It truly is one of my favorite things, and a near perfect cold soup for hot weather.